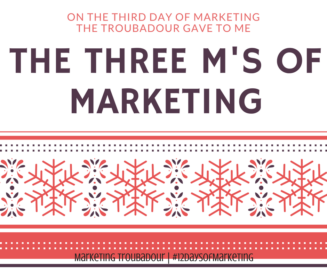 On the third day of marketing, the troubadour gave to me The THREE Ms of marketing you must master: Message, Market, Methods. What are you saying, who are you saying it to, and what is the best way to say it: these are your basics. The 3 Ms are like the three legs of a stool, without all three you will stumble. If you nail your message but deliver it to the wrong people, you miss opportunities. If you have the perfect audience targeted but choose the wrong way to reach them or the wrong message, you miss opportunities. It is worth your time to remind yourself of the 3 Ms whenever you begin a new campaign, so you can say the right thing to the people you want to reach, and increase your odds of success by choosing the communication method they prefer.